Before I begin writing my review, I must admit that I have not been able to read the book cover to cover yet. Although, I am dying to! This book was received in the mail yesterday. 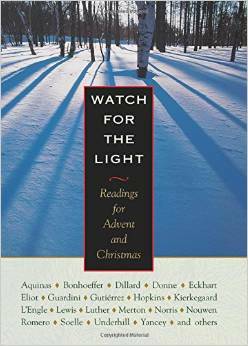 It was the perfect day to have it arrive because it is daily readings for the Advent and Christmas season. As God’s wonderful Hand guided this book to my house to appear on the same day that the devotions started, I knew that this was a good sign. Last night, I read November 24 daily reading. Written by Christph Friedrich Blumhardt it speaks of what the Advent really is. Definitely a good reminder to our weary hearts and our busy lives. Today’s reading was a poem by Sylvia Plath. While I am not one who likes poetry. Or even understands it. I tried my hardest to put the pieces together and came out with my own interpretation of it. I suppose that is the beauty of poetry and art. One sees what they see. I skimmed through the book, without spoiling any of it for myself, and am very pleased. I am looking forward to spending my Advent season reading these daily devotions to uplift and encourage my spirit while I am trudging through the shopping centers or dreading that family get-together. If you have the opportunity to get this book and read it, do it! *Disclaimer I was given this book to review by Plough Publishing House as part of the Handlebar Team in return for my honest review. I was a little bit disappointed when I saw the reading level of this book. I was not aware that it was for a little bit younger kids than my own. With that said, it’s still a great book. My son is just above this reading level, which is listed on the back cover as RI 2.1, RL 2.3 and RI 2.5. He looked the book over and thought that it did look interesting enough for him to read anyway. It will be added to his pile of books to take on our vacation next month. My daughter, who is 11, said this was way too young for her. She also said it’s too boring and school-like. But she did express an interest in reading the Mary book of this series. 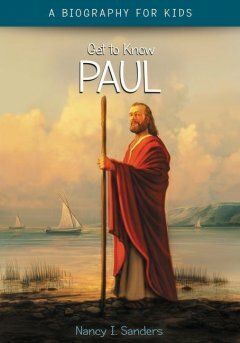 I have read through this book and think that it is a very good choice for young readers to introduce them to Bible people. The book has photos and illustrations through out, to make sure and keep the interest of readers. Definitions of words are included for many and added as an extra decorative box on some of the pages. The word is also highlighted in colors through out the book when there is a definition that accompanies it. This book has sections on Bible heroes, extra unknown or maybe known facts and many other little things spread through the book. I really like how well everything is explained. I would definitely recommend this book for those of you with younger readers. The whole series would be excellent additions to any homeschool, or home, library. Disclaimer: This book was given to me by BookLook Bloggers in exchange for my honest review. I wake up in the morning and have chores to attend to. The cats, all five of them, are waiting ever so patiently for me to feed them. The three in the house wind around my feet as I prepare the water for my coffee. The other two that like to spend nights outside, will come running to the door as soon as they hear me. The ducklings hear me attending to the cats and start peeping to let me know that they are ready to eat also. I finish preparing my coffee in my French press and get the ducklings food out. I let them out to eat while I finish and wait for my coffee. It has become my habit to go straight to the computer and start earning my Bing rewards and my Swagbucks. Both are going to help me pay for a trip that I’m taking next year. While I am doing those, I read my devotions, Bible and a Christian book. Lately, prayers have been a huge thing that I have been reading about. I blogged last Saturday about The Power of the Word. I wrote about how prayer has recently touched my life and shown me so much. For the past two months, I have been reading prayers for the kids. I’m sure many of you have heard the book The Power of a Praying Parent by Stormie Omartian. I have the little book that goes along with that, with all of the prayers included, called The Power of a Praying Parent Prayer Book. I started with reading that little book, saying a prayer each morning for the kids. I then re-read the book and said the prayers each day. One chapter per day gave me one prayer per day. After that book, I read the little prayer book again. I have covered my children in prayer the past two months. I read these prayers aloud, even if I have to be quiet so I don’t wake them, in the early morning while sipping my coffee and earning Swagbucks. Now let me explain why this is relevant to you, or why you should care. I have always known that prayer had power. Growing up in churches, you learn that. (I hope.) I have even had my share of answered prayers. For example, I vividly remember a day when I stood with my kids in Safeway. Only a few dollars to spend. I had said a prayer to God to ask him to show me what I could get with my few dollars for dinner. As I stood in the middle of an aisle, pondering what to get, an older woman walked up to me. She had tears in her eyes and explained to me that God told her that I needed help. She had gone through the line already and as she did, she grabbed a Safeway gift card. She handed me that card and told me that God told her to do it. We hugged and I thanked her and silently thanked my Heavenly Father. The amount that she gave me wasn’t a huge amount, but it bought us dinner, milk and she told me to buy the kids a candy. Now explain to me. If God is not real, how in the world would that happen? Ever? See, I’m not a stranger to prayer. But….here’s what I am a stranger to. Seeing the power of Bible verses being read working in the lives of my children. Driving in the van yesterday, the kids and I were talking, as usual. Amanda told me that she has recently felt like she should be praying more. She has stopped to take the time to tell God that something is pretty, or just to thank Him for something. Another thing that she has started is praying when she wakes up. My son then adds, that he also, has felt the need to pray more. Imagine how my heart soared to hear this! My prayers that I have been saying in the morning are working! Some of those prayers ask for my children to want to feel closer to God and have a strong relationship with Him. Seriously, what more can a mother ask for than for her children to have a wonderful relationship with our Heavenly Father and Loving Creator?! I have also witnessed, just this past week, an occurrence that I was able to use prayer during the situation and it worked right then and there. I won’t get into any details because those are not important. But someone I love was getting into something that I think is steeped in demonism. I prayed right there for that person to feel guilt for being even a little bit interested. Within 30 seconds, that interest was cut off and moved onto something else. I thanked Him once again as I sat there in awe. The next goal that I have is to find Bible verses to pray over my daughter and a specific issue that we are going through. And I just bought The Power of a Praying Wife by Stormie Omartian yesterday at Goodwill. I have read that before, but I believe I got it from the library. I want the prayers here on my shelves to read each morning like I do for the kids. I challenge you to try this. Find some Bible verses, or prayers that are already written, and start your own prayer legacy. Bible verses for different topics are easy to find. Tomorrow morning, as I enjoy my Starbucks Breakfast Blend cup of coffee, and delve into my prayers for my children, I will think ahead of the many blessings that are to come. Prayer hasn’t always been an easy thing for me, but you know the saying, “Practice makes perfect” and that works the same for praying. 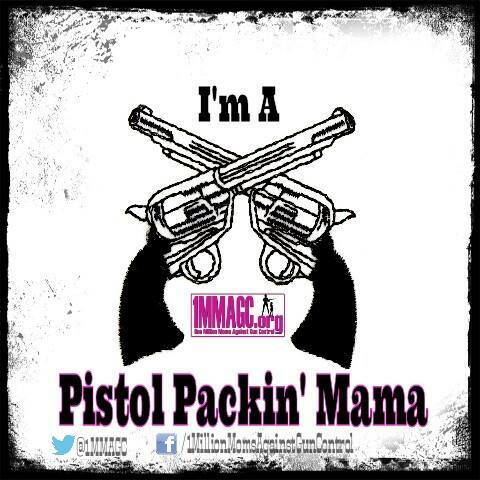 The more I pray and learn how to pray defensively, the easier it gets for me. I’d love to hear your prayer results! If you already have a wonderful story to share, I’d also love it if you shared it with me! Until next time, many blessings! The last couple of months have brought me deeper into Spiritual warfare study than ever before. I’ve read about the subject a few times. I have books on my shelves on the subject. But I’ve felt the need to dig a little deeper lately. A couple of months ago, I had an experience, like no other. I’ve only shared this experience that I had with my husband. I have not spoken the words aloud to anyone else. I’m not going to get into what happened now. Just know, I did not get harmed and nothing out of the ordinary happened. But the experience showed me that I needed to toss aside my lax attitude about my Spiritual warfare and start taking active control of it. So, I did what I do best. Found all of the books that I could read about the subject and uploaded all that I had to my Kindle. I also read a book that I have on my shelves called A Woman’s Guide to Spiritual Warfare by Sherrer & Garlock. I have since decided that I need to be a lot more disciplined in my prayer life. My prayer life needs to be more active and more ongoing. Naturally, the next step is reading all about prayer. I have come across the idea of a prayer closet. I’m really drawn to this. I am going to convert my closet in my bedroom for this. I’m really excited about it! It will be part of my Operation Spring Clean that I have currently going on. In my research, I am trying to teach myself new ways to use the Bible in prayer. Using verses out of the Bible is very powerful. It’s the Word of God! By practicing this, I am also bringing the blessing to my children. My son has a time at night most nights getting to sleep, and then resting well once he’s asleep. I wrote down a Bible verse for him that is adapted to fit him. When we say our prayers at night, he repeats this verse. He told me the 2nd night that we did this that he believes it helped him sleep the night before. I silently thanked God. By doing this, I will also hopefully, memorize more Bible verses. That is something that I have not ever enjoyed doing. But I need to have some of those verses ready to use if needed. Praying is the most powerful tool that we have. Who wouldn’t want more alone time with our precious Heavenly Father anyway? The more I pray, the more I am finding it easier to pray. I guess it’s like anything else. Practice makes perfect. There have been times when I wondered if the Amish life would be good to live. With the lack of electrical devices and things of that nature, your free to think of God all of the time. But what if your salvation counts on the good deeds you do, rather than your belief in Christ? The Amish are very worried about rules and traditions. It’s their way, or the highway. As much as the basic and simple life seems a little thrilling to me, I think the focus is way centered on your deeds, instead of your beliefs. This young couple, after the loss of their daughters, started to wonder about their religion. 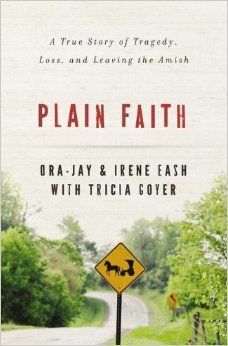 They had answers that were not getting answered within their own religious confines of the Amish. How can you understand the Bible verses when they are always said in a language that you don’t understand? I think the biggest concern that I had with the Amish people was that how many of them are so unsure if they will be in Heaven. How sad! I know, without a doubt, that I will be in Heaven! I do not have to worry about what I do, although, I have to watch what I do. But when I do good, that does not get me into Heaven, and when I do bad, that will not keep me out of Heaven. To see this family grow and struggle, but reach the blessed points of their lives to see their children come to Christ! What a glorious blessing! I have never been disappointed with a book written by Tricia Goyer. She is an excellent author and she does have such a love for people. Disclaimer: BookLook Bloggers gave me this book in exchange for my honest opinion in the form of a review.